Super magnets that can hold it together. They have a proven track record as newspaper holder and bicycle clamp. Their adhesive force is not afraid of thick fabrics either: They go through four layers of jeans when used as a bicycle clamp. 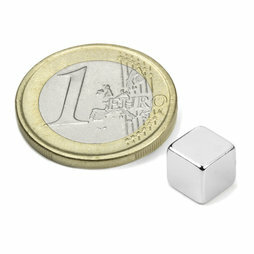 On a magnetic glass board these cube magnets go nicely with S-10-10-N disc magnets. Their adhesive force leaves nothing to be desired, and at the same time they are unobtrusive with their 7 mm edge length.